When you live in a small town, it’s easy to assume that you know about new developments in the community, however big or small. 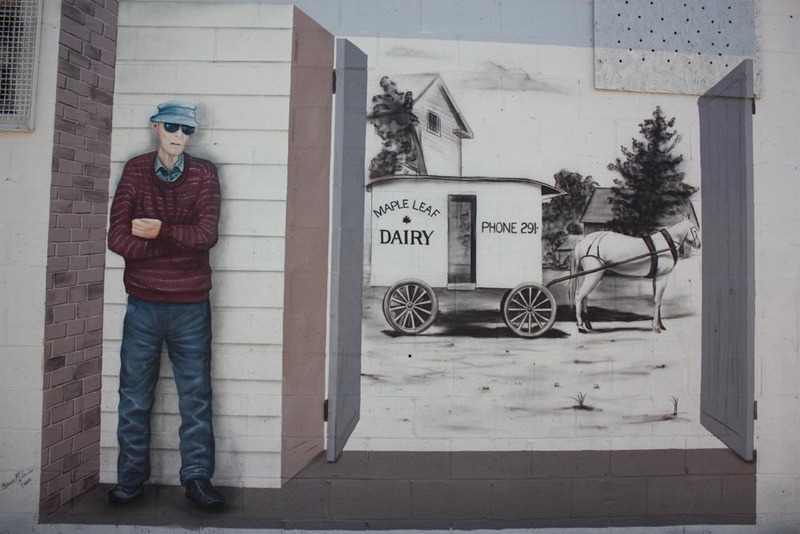 If you’ve ever taken a stroll or drive through the streets of Carleton Place, you may or may not have noticed the murals decorating the sides of some of the original, older buildings in town. These murals, scattered throughout town, give residents and visitors alike a small taste of our rich heritage, some old and some new. 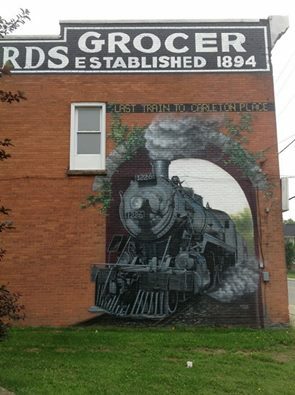 Starting where Coleman Street crosses Franktown Road, you’ll see a mural depicting the Last Train to Carleton Place, which took place on January 8, 1960, and the former site of Edwards Grocery Store, which opened in 1894 and remained in the corner building until 1977. Following Bridge Street, you’ll come upon an important landmark on the main drag. The Queen’s Hotel might be the only building left in town that has (almost) continuously been used as a hotel and bar since it was built in 1870. At times it may have had a seedy reputation, but the sign painted on the left side of the building’s front façade adds a certain amount of heritage value to the re-imagined New Queen’s restaurant and bar. They never have a problem drawing a crowd, especially given the fact that everyone in town likely has a story or experience that connects them to the bar and brings them back every weekend. 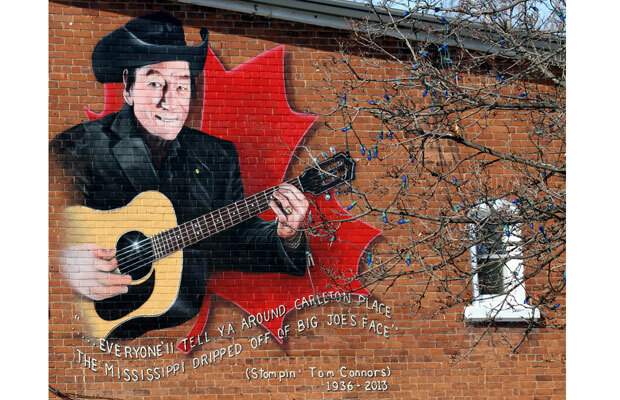 Turn the corner onto Allan Street and you’ll see the newest mural, paying homage to one of Carleton Place’s best known residents: “Wandering” Wayne Richards. Richards earned the nickname because he could always be seen walking around town, chatting with members of the community or standing at his usual perch in front of the Queen’s Hotel, making the placement of the mural, on the Allan Street wall of the building, all the more fitting. Heading toward the bridge, take a turn down Mill Street, beside the Town Hall. There you’ll first see the advertisement for Taylor’s, a former hardware store and garage that was owned by the Taylor family from 1888-1930. The arrows, along with the advertisement, were repainted in 2010 and will lead you to the beautiful new mural celebrating Carleton Place’s own theatre troupe, the Mississippi Mudds. 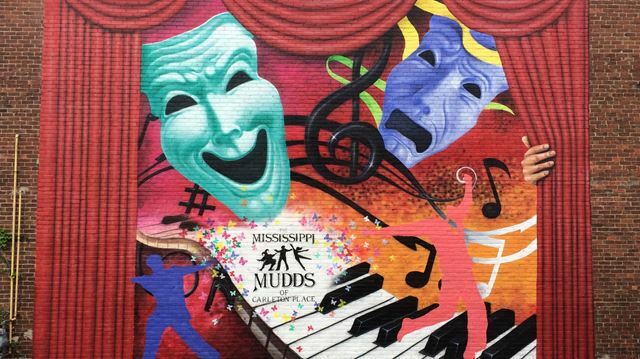 Founded in 1973, the Mudds have played an instrumental part in keeping the theatre community alive and thriving. The mural, painted in 2015 by resident muralist Shaun McGinnis, boasts musical notes, butterflies, piano keys and more, all done in bright colours which fittingly represent the fun, boisterous community group. Across the street from the Green Counter Boutique, behind Town Hall, six murals were completed in 2014 to memorialize multiple important moments in the town’s history, including the Ballygiblin Riots and the establishment of the Carleton Place Canoe Club. From the bridge just past Town Hall, you can see the sign for Patterson and Son Funeral Service and Furniture Dealers, which opened in the 1890s and was owned by the Patterson family until 1976. The sign, which was repainted in 2010, can be seen on the river side of what is now Essentials Health and Beauty, just around the corner from the plaque commemorating Findlay’s Foundry, a former iron- works that operated from 1860 until the 1970s on the now-empty lot across the river. Crossing the bridge, you won’t be able to miss the stunning tribute to Captain A. Roy Brown. 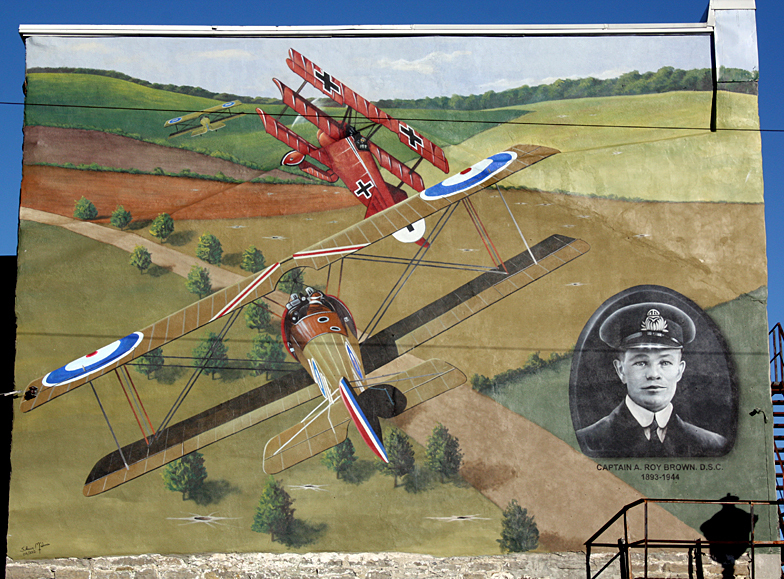 The mural, painted in 2012, depicts his famous WWI air battle with The Red Baron, whose defeat is attributed to fatal shots fired by Captain Brown. There are many more opportunities to take a peek into the town’s past, including a visit to the Carleton Place and Beckwith Heritage Museum, located at 267 Edmund Street, where you’ll see that some of the old cement windows behind the building have been transformed into Windows to the Past by local artists Mary Jane Lancaster, Adrian Baker and Angelique Willard. 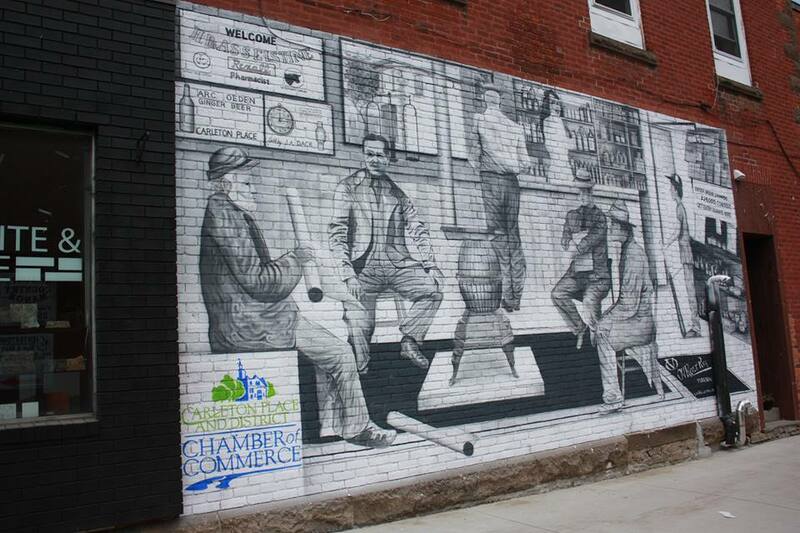 The most recent mural, celebrating the 100th anniversary of the Carleton Place and District Chamber of Commerce, was just unveiled on Franklin Street. Many bits and pieces of history are tucked into it, and together they tell the story of a century of business in town. We are fortunate that so many members of the community take pride in remembering the rich history of our town while also acknowledging contributions made in the present. It’s a great feeling to watch history unfold before us through art, and amazing to think that any person or business could be working towards their future mural on the landscape of Carleton Place.